Easter Island, Chile...Located 2,300 miles off the coast, considered the most isolated inhabited island in the world, actually closer to the Pitcairn Islands than the South American continent. This tiny island, so-called “Easter” because it was discovered by Dutch explorers on Easter Sunday in 1722, is only 14 by 7 miles. 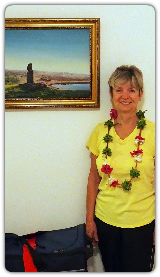 The island’s original, traditional name is Rapa Nui. After a delicious breakfast prepared by “Ramon’s mom” and meeting the other guests, our Rapa Nui guide, Patricio took us to see the most important and evocative moai (stone statutes). We visited the Rano Rarakii Quarry, where the statutes were carved before being transported to the ahu (platform or alter) to be displayed. This area was absolutely jaw-dropping! Phil and I stared in amazement at the many statues, some completed, some still partially embedded in the volcanic stone. One big fellow, still attached to his bed of rock, is estimated to weigh 210 tons! Walking among them was truly a dream-like experience. Today there are between 850 and 1,000 statutes at various spots over the island. While all are large, some are 40 feet high and weigh as much as 75 to 80 TONS! On our second and third days on the island we rented a car and struck out on our own. The island is easy to navigate, but car insurance is not available. Our main concern was not other drivers or road conditions, but the many wild horses, left years many ago by Spanish missionaries. 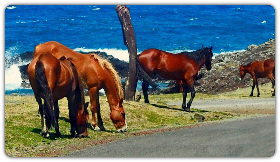 These beautiful horses have complete run of the island and do not hesitate to cross the road, completely ignoring the oncoming traffic. We stayed vigilant, and drove the car for two days without incident. 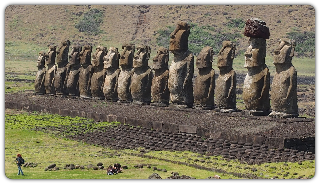 Other than the quarry, the most famous group of moai are at the Ahu Tongariki, where 15 mighty statutes greeted us in stony silence. The largest fellow weighs 87 tons and is 30 feet high! 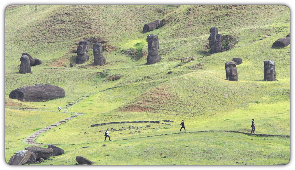 Many of the moai were knocked over by tsunamis and civil wars. We learned that we have the Japanese government to thank for these moai standing upright on their ahu today. Some of the statutes sport a red “top knot” or hat. The hats were carved at a different quarry than the statutes. There are only about 100 top-knots on the island today. Some are on or near various moai and some are still in the quarry where they were carved. Because of their cylindrical shape a number of them rolled into the sea during past tsunamis. Each one weighs as much as 11 tons. 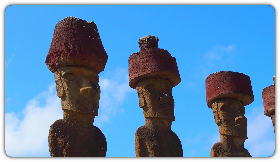 Experts say the top-knots were added years after the moai were standing on their ahu. In addition to visiting many of the moai sites we spent a morning poking around the grounds at the Orango National Park. and we returned to Ahu Tongariki for a hauntingly mysterious sunrise. 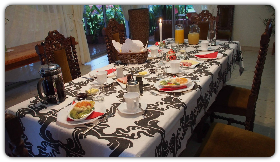 We ate at excellent restaurants and there are any number of hostels, B&Bs, and hotels on the island. Easter Island isn’t easy to get to, but if Stone Henge and the Egyptian pyramids interest you, Easter Island should be on your list. The island’s history, both factual and legend-–make fascinating reading. 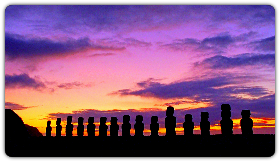 What was the motive of the ancient Rapa Nui to build these giants? How did they move them? Only THEY know for certain.